Place chicken evenly in bottom of ungreased 13x9-inch (3-quart) glass baking dish. Spoon and spread soup evenly over chicken; sprinkle with cheese. In medium bowl, stir bread crumbs and melted butter; sprinkle over cheese. Bake 30 to 35 minutes or until cheese is melted and bread crumbs are golden brown and thoroughly heated. Your grandma probably didn’t use panko bread crumbs, which are crispy crumbs used in Japanese cooking. But she’d definitely embrace them if she were given a box. Panko makes topping a casserole quick and ensures there’s good texture and contrast to the creamy center of the hot dish. Sub in crispy French-fried onions to top the casserole or try some other types of cheese, depending on your family favorites. Leftover roast turkey is a great substitute for chicken in this recipe—especially the day after Thanksgiving. This easy chicken casserole recipe is brimming with old-fashioned goodness, but it comes together with super-modern speed. 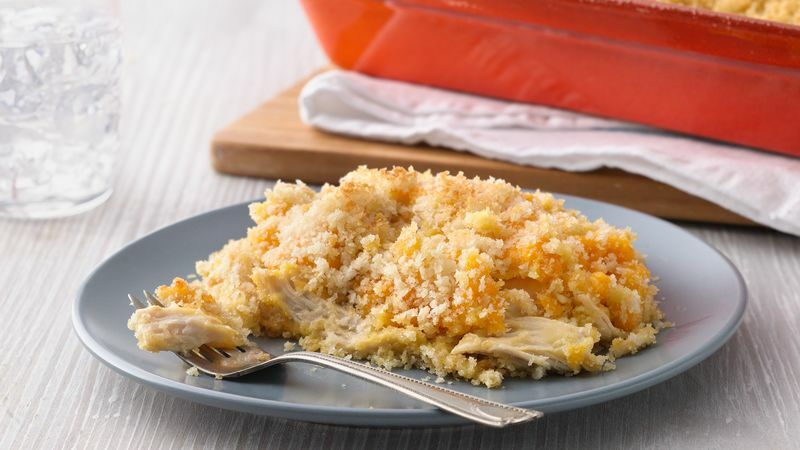 You’ll need only 10 minutes of hands-on prep time before you pop the chicken casserole dish in the oven, thanks to smart-shortcut ingredients like cream of chicken soup, shredded cheese and bread crumbs. If you have leftover rotisserie chicken, a surplus of day-after holiday turkey or any other leftover protein, reach for this recipe and add three cups of any cooked meat when you toss together the other ingredients. Or eliminate meat altogether, swapping in a few handfuls of drained, frozen spinach, cooked and frozen broccoli florets or sautéed Portobello mushrooms to make a satisfying vegetarian meal. If you’re ready for more easy, one-dish chicken comfort food, browse all of Betty’s best chicken casserole recipes.